Paraffin. 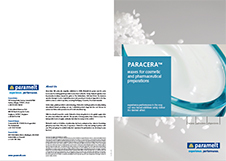 Paracera™ 11946 by Paramelt acts as a consistency factor. It is a blend of primarily linear mineral and synthetic waxes. It imparts advantageous properties in warmer climates due to its higher temperature stability. It has superior gel forming properties with oils and excellent gloss from enhanced macro crystal formation. Paracera™ 11946 is also used to give stick products good structure and hardness and prevent tackiness in decorative cosmetics. Its applications include creams and ointments and other cosmetic care products. It has a shelf life of at least two years.